Invisible Man: Gordon Parks and Ralph Ellison in Harlem is on view May 21 to August 28, 2016 at the Art Institute of Chicago. The exhibition presents artifacts, including photographs, contact sheets, and manuscripts, that showcase the collaborations of two giants of American art and literature. More than 50 of these items have never before been on public display. 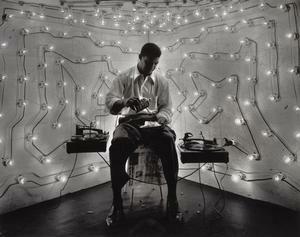 In her lead essay for the hard cover book published in conjunction with the show, curator Michal Raz-Russo directs our attention to a little-known collaboration between Gordon Parks, celebrated for his photo-essays for Life magazine, and Ralph Ellison, best known for his novel, Invisible Man. “Harlem is Nowhere” is the other collaboration central to the exhibition. The exhibition catalogue includes an essay by Jean-Christophe Cloutier, assistant professor of English, University of Pennsylvania. In April 2016 I spoke with Cloutier about what led to his focus on this collaboration between Parks and Ellison. 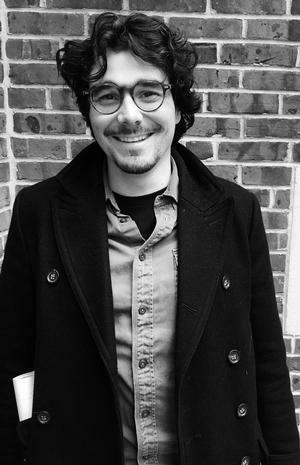 As a graduate student in 2008, Cloutier was convinced that Ellison’s Invisible Man was in dialogue with the emerging superhero genre in comic books. Curious about references to comic books he found in the novel, Cloutier noticed an allusion to psychiatrist Fredric Wertham. Wertham directed an anti-comic crusade and authored the treatise Seduction of the Innocent based on the premise that comic books led to juvenile delinquency. While Wertham’s efforts to eradicate violence depicted in media directed at children proved unpopular and finally unsuccessful, at its core his work held society responsible for promoting the mental health of its populace. Cloutier uncovered the photos taken by Parks in 1948 that were meant for publication alongside “Harlem is Nowhere” in ’48: The Magazine of the Year. Pictures of the inner workings of this facility in Ellison’s mind served as documentation as well as mouthpiece. Unfortunately, the magazine went bankrupt just days before its release, leaving the images and the essay without an outlet for some time. Years later in 1964, Ellison published “Harlem is Nowhere” (without photographs and with no mention of Gordon Parks) as part of his collection of essays, Shadow and Act. Subsequently, the connection between the photographs and the essays was nearly lost to history. 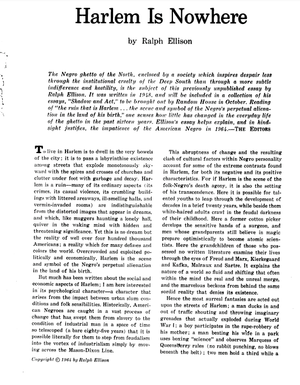 Interestingly, Cloutier notes that Harpers Magazine also published “Harlem is Nowhere” in 1964. This iteration, however, was published without the passages about the Lafargue Mental Hygiene Clinic but alongside photographs of the neighborhood. 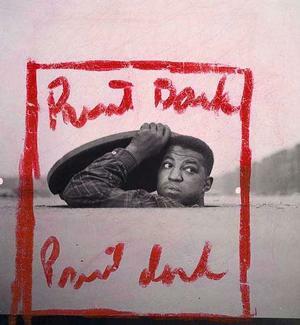 These photographs, however, were not taken by Gordon Parks. Instead, they were taken by native Harlemite, Roy DeCarava, the photographer who collaborated with Langston Hughes on The Sweet Flypaper of Life. While Sweet Flypaper celebrates the tight and gritty city, Ellison used DeCarava’s images to offer critique. 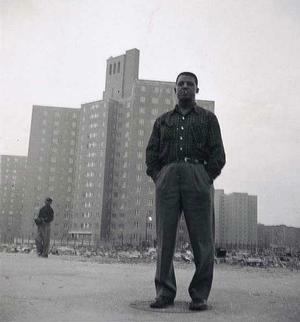 Cloutier describes two photographs that are nearly identical: the first appearing in Sweet Flypaper and the second alongside “Harlem is Nowhere” in Harpers Magazine. This piece was published just after a young boy named James Powell was killed by police. In calling our attention to this work, Cloutier asks us to reflect upon Ellison’s deployment in 1964 of text and image as a kind of temporal collapse that bring the 1948 essay together with a 1952 photograph. It’s a political act. Cloutier asserts that this kind of use of image and text operates “above ground,” as opposed to the more subtle tactics often referenced in his most famous work. Ellison draws material from the past to release in another moment, which is what happens with this exhibition and catalogue now. Photographs, Cloutier told me, were very important to Ellison. He had letterhead with his name appearing “Ralph Ellison, photographer.” Ellison’s papers include a photographic division and the exhibition catalogue includes pictures taken by him. Ellison saw himself as a photographer. And in an effort to refine this skill, Ellison viewed Parks as a model. According to Cloutier, correspondence between Ellison and Parks revealed how much Ellison relied upon Parks for advice about content as well as technical guidance on equipment and the like. The two men went on photo-shoots together. Many of the most recognizable portraits of Ellison were taken by Parks; meanwhile Ellison was taking similar shots of Park—on the same bench, by the same tree, at virtually the same moment. 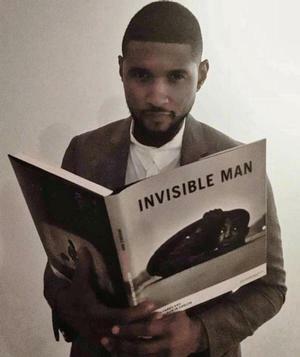 Moreover, Ellison imagined his novel Invisible Man would be accompanied by photographs taken by Parks. Cloutier describes a shooting script Ellison wrote that reads like a set of instructions for Parks’s photography but also for his own prose. Because of his dual concern with portraying historical accuracy and allegory, Ellison directed Parks to render pictures that work as documentary and as symbol. Cloutier found in the archives held at the Library of Congress, by the Gordon Parks Foundation, by Ellison’s estate, and even in the papers of Fredric Wertham clear evidence of a vibrant working relationship and mutual influence between these men. For instance, Cloutier describes photographs Parks took of a storefront in Harlem showcasing a dream book that mirrors another taken by Ellison, which also appears as text in the novel Invisible Man. For Ellison, photography was democratic. After all, pictures can be taken of anyone by anyone almost anywhere. This idea resonates even more readily in the 21st century world where cameras are ubiquitous and the control of those images and access to distribution outlets is more broadly dispersed. And the picture is a means by which citizens document nearly any and every aspect of their lives. 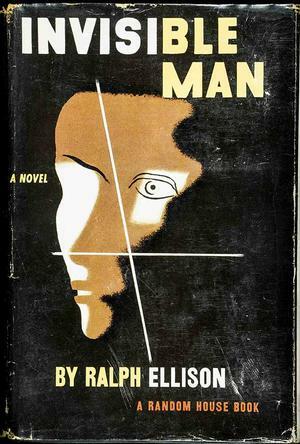 Invisible Man: Gordon Parks and Ralph Ellison in Harlem elucidates the significant ties between the artistic output of Gordon Parks and Ralph Ellison and suggests the inter-relations of artists and thinkers living at the same moment and in the same city. It prompts questions about the role of art—specifically photography—and literature but also questions the modes of distribution and capacity of institutions to meet the needs of the people. Valerie Sweeney Prince is the author of Burnin’ Down the House: Home in African American Literature. She is an associate professor of English and black studies (and co-director of black studies) at Allegheny College. "The Story Behind the Photograph," recollections of a photo shoot during Gordon Parks' final year.